Photo by & Copyright Shiggy Ichinomiya 2013. All Rights Reserved. Used here with permission. "South Swell in the water!! 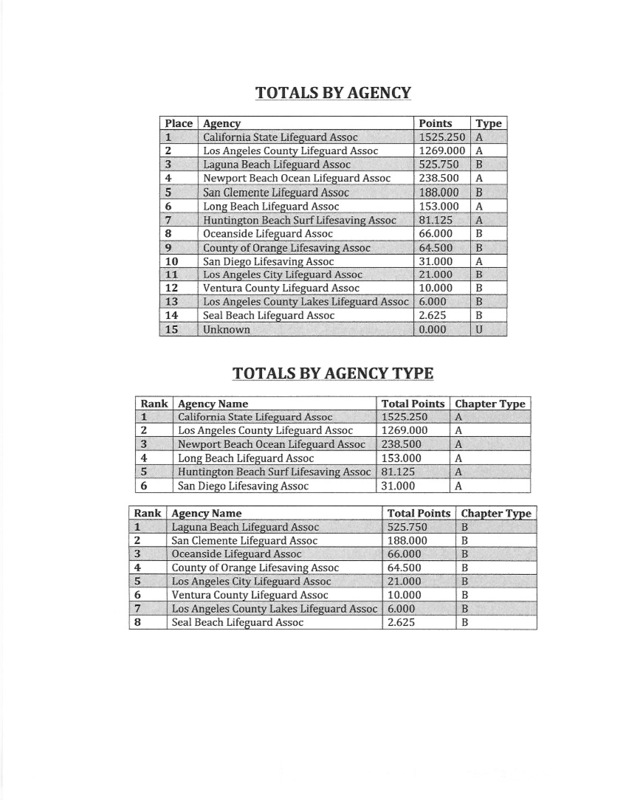 Here is your advisory from @NOAA and @NWSLosAngeles http://ow.ly/i/2KVNF ‪#‎SummerSafetyLA‬ "
"County Recurrent" also scouted out the waves from the Santa Monica Pier this afternoon and the onshore wind was strong with guards wearing their hoodies even! 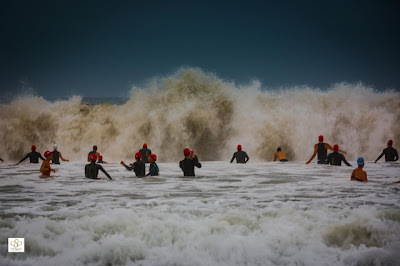 At this past Saturday’s CSLSA Lifeguard Regional Championships on July 27th, in Newport Beach, the "California State Lifeguards" (CA State) clearly came to conquer. The group scored 1525.250 points, compared to LACoLA’s 1269.000 points. (Team totals attached). It should be noted, however, that CA State had 96 competitors compared to 50 for LACoLA. 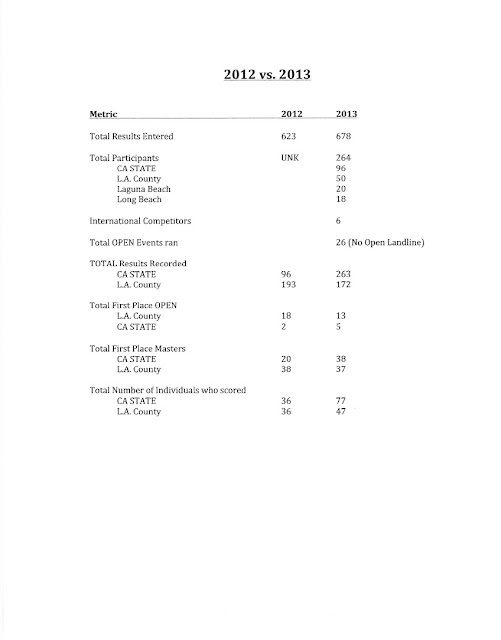 Yet, LA had the most First Place finishes in the highly-competitive Open Category with 13, versus 5 for CA State. In the Masters category, where it is divided into 4-year increments beginning at age 30, CA State edged out LA County by one with 38 First Place finishers. And 77 CA State guards had First Place finishes, while LACoLA had 47. While we know how proficient the under-30 set is, let’s take a moment to focus on the considerable successes of the 40-plus folks! Of LACoLA’s 37 Firsts, Steve Morgan, the oldest competitor of the weekend (70+) nailed two First place finishes. Props also go to Eldin Onsgard, who scored 6 Firsts in all 6 of the Age Group events (60-64) he entered. Other LACoLA “Old Guys” such as professional photographer/OLS retiree Joel Gittelson, OL and JG Instructor Steve Contarsy, and raconteur Kip Jerger, among many others, had notable showings. A big well done to all those guys for still competing! And we might want to ask Chris Linkletter what she puts in her coffee. 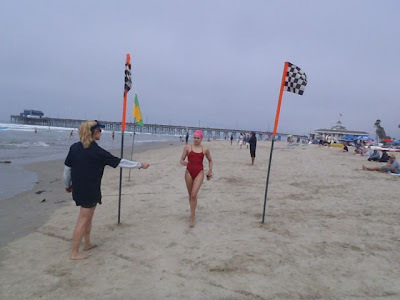 The diminutive dynamo entered 12 events -- 5 Age Group events (45-49) and 7 Open events -- and by doing so scored First 4 times, Second 3 times, Third 2 times and Fourth twice!! LACoLA’s competition stalwarts Taylor Spivey and Brian Murphy also did well. Among Brian’s two firsts, they included the brutal International Ironman. He finished second place twice and had one third. Taylor nabbed three Firsts, two seconds and two thirds, in both group and individual events. One of her firsts was in the grueling American Ironman. Honorable mention goes to legacy OL Kelsey O’Donnell for her three firsts, including one in the International Ironman. Her dad Mike, btw, took home a first in the 50-59 Run-Swim-Run. Additionally, last year’s big winner, LACoLA’s Rob Pelkey did not compete this year due to a work conflict and couldn’t defend his Ironman title. A head to head match up with Pelkey and Murphy (who was competing in Hawaii last year) would’ve been a show-stopper. Congrats to everyone who braved 61/62 degrees water (it was 70 degrees three days earlier) and to the Newport Beach Ocean Lifeguard Assn. for a terrific job hosting the event. 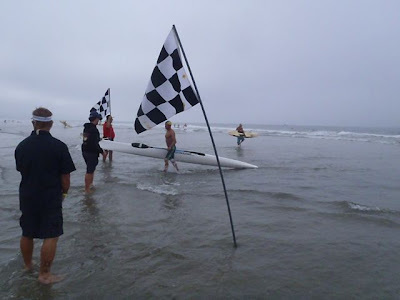 The fun continues next week with the USLA National Lifeguard Championships that will be held August 7-10 in Manhattan Beach, south of the MB Pier. (Aug. 7 Jr. Guards compete; Professionals compete Aug. 8-10). 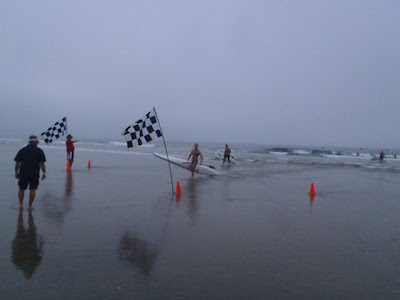 Editor's note: Many Thanks to lifeguard/paddler/media guru/Wahoos fish tacos connoisseur, Adam Sandler, for sharing the results from this year's CSLSA Regionals, as well as for allowing us to post his photos from the event. Los Angeles County Ocean Lifeguards who are full time students are eligible for the scholarship. In addition to completion and filing of the electronic application, candidate’s transcripts must be forwarded c/o PLF 743 Almar Ave, Pacific Palisades, CA 90272. The PLF application site will be live accepting applications through August 4th. The Taplin Bell Trophy! Photo by Will Maguire. Swimmers are Micah Carlson, Matthew Fink, Chris Day, Nick Macko. Paddlers are Sean Bartlett, Jeff Monroe, Chris Maloney, and Tim Burdiak. Rowers are Mike Wurzel, Craig Douglas, Scott Bredesen, Scott Moore, Evan Cassady, Lars Gustufson, Jessie Simon, and Will Didenger. Congratulations to all of these fit LACo lifeguards! Best wishes in the race! For all those who have appreciated Joel's photography over the years and for those of you who would like to see some really great photos of our ocean landscape, here's your chance. Photo by & Copyright Joel Gitelson. Used here with permission. San Pedro, California. (August 1, 2013) – Michael Stearns is proud to present the gifted Joel Gitelson and his large-format photographs at the opening of the August exhibit for Michael Stearns Studio 347. The show, aptly named “Local Waters”, begins on August 1st for San Pedro’s First Thursday Artwalk, continues with an artist reception on Saturday, September 14th and will remain on view throughout the months of August and September. The photographs in this exposition are a compelling demonstration of Joel’s passion for the ocean and the coastline along Southern California. After retiring from a career as a Los Angeles County Lifeguard and Paramedic, Joel has continued to cultivate his ardor for marine life as a prolific photographer. His renderings of the sea set against a deep line of blue sky, grainy sand and familiar landscapes incite the senses and mesmerize the observer. Joel accomplishes this well. By capturing the magnificence of the local shoreline, he builds on the community’s appreciation of its location. The Pacific manifests into more than just an ocean; it represents a primal persuasion that instantly delivers an assortment of feelings and delicate innermost imaginings that transport the viewer to another place, another time. With a mysterious longing for a corner of harmony and silence, one can hear the waves thundering and touch the spray of watered salt. This multitude of sensations is the focal point of Joel’s photographic exploration of the sea. The basis of these images reflects the intense, multifaceted aspects of the Southern Californian seascape. The results are spectacular. With fluid ease, Joel mingles the skill of photography with the wonder of the environment in a union that drives the audience to take a moment, breathe and relinquish. To witness Joel’s work up close, please join us at Michaels Stearns Studio 347. Admission is free to the public and the exhibit will be open from 6:00pm to 9:00pm during the First Thursday Artwalk on August 1st with an artist’s reception on Saturday, September 14th from 2:00pm to 6:00pm. Michael Stearns Studio 347 is located at 347 W. 7th Street, San Pedro, CA 90731. For further information, please visit www.michaelstearnsstudio.com or call (562) 400-0544. *** Thanks for the heads up, Joel! Perhaps we can organize a "Lifeguard V.I.P. Event" at the Gallery?... Let us know and we will announce it. Joel Gitelson with his Bronze Savage, on the occasion of his retirement, June 2012. Photo by Will Maguire. For many years, Pete Accardy, was the Swim Team Coach at C.S.U. 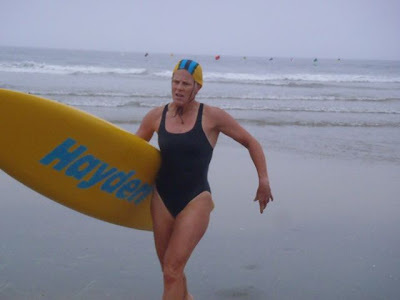 Northridge and he was responsible for making fast so many swimmers who later became L.A. County Ocean Lifeguards. We have been asked by a couple of Pete's swimmers and lifeguards to post the link to the CSUN tribute online. Many thanks to Michel Lee Hampton for forwarding the following quote and link! "Pete Accardy, one of the great figures in the history of California State University, Northridge’s athletics program, passed away on July 13 after battling cancer. Accardy won several national titles as CSUN swim coach during his 24 years on the Northridge campus, and in 1982 became the first coach in NCAA history to win national championships in the same season in two sports (men’s and women’s swimming)." Veteran OL Chad Carvin milking a nice long wave all the way to shore... to finish First! And claiming the Fourth spot and making the team is Rookie OL Sean Lane!